EAPN annual Policy conference 5 July: Social Protection for All! How can the Social Pillar and SDGs build stronger welfare states? 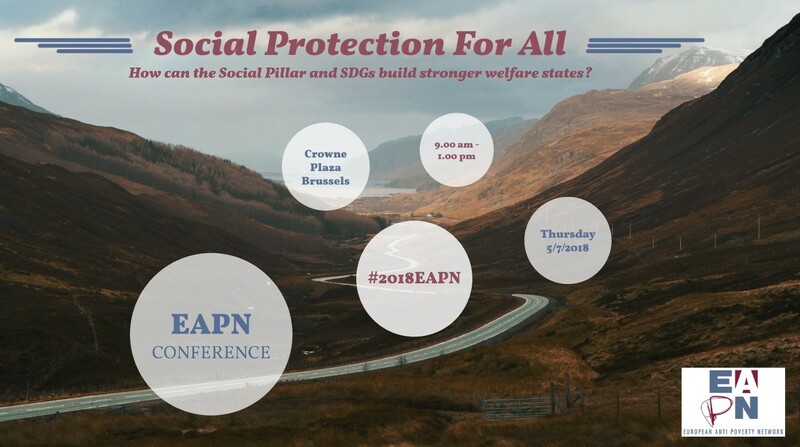 EAPN’s annual conference will be on 5 July, 9:00-13:00, under the title Social Protection for All! How can the Social Pillar and SDGs build stronger welfare states? What is Social Protection for all? How can we ensure that all people, children, adults and older people get right to adequate and equal protection against all life risks? Do we need a new concept of ‘Welfare States’? How can this be achieved ensuring fairer redistribution? Give special attention to the financing and concept of Welfare states with input from the ILO and other Civil Society Organisations. The conference will be from 9:00-13:00 in the Crowne Plaza hotel, rue Gineste 3, 1210 Brussels. Participants: Around 80 EAPN members, including people with direct experience of poverty, and around 60 external stakeholders participants. See the full webpage about the event here.